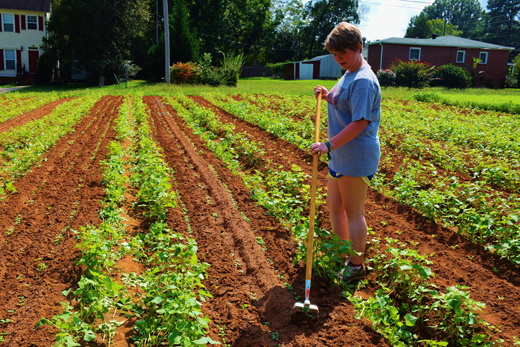 Students help with crops at the Oxford College Farm. Fresh, seasonal organic produce grown at Emory’s Oxford College Farm will now be available on the Atlanta campus. A Community Supported Agriculture (CSA) Program, which offers a seasonal subscription to the Oxford farm, will provide boxes of food delivered regularly to the Emory campus for faculty, staff and students. CSA boxes will be delivered to the Emory Farmers Market, held monthly during the summer with upcoming events slated for June 23 and July 31. “They will be filled with an ample mix of the best the farm has to offer,” says farm manager Daniel Parson. “July is the month for tomatoes, peppers, okra, beans and other summer goodies,” he adds. The CSA from the Oxford farm will also be offered in the fall season when participants can sign up online for weekly pickup at the Emory Farmers Market. Cost for each season works out to about $32.50 per week, so the two-week summer season is $65. The 10-week fall season is $325. To sign up for summer, email Parson. Payment will be collected at pick-up. Subscribers can sign up for fall and pay online. For questions, email or call Parson at 404-452-4321.